I spent last week at Edisto Island, South Carolina. I own a timeshare that has seen embarrassingly little use during the years that I’ve owned it and I decided it was high time that I got better value from my investment. So I chose a place I’d never been before, coastal South Carolina, to spend a week exploring, sightseeing and learning. From the balcony of my condo I had a gorgeous panoramic view of the golf course, swimming pool and a nearby pond. Immediately outside the balcony was a spectacular, ancient shade tree, pruned and molded to fill the space between the buildings. It had gnarly bark and from one basic trunk, it wound and twisted it’s way up to higher than the three stories of the adjacent buildings. As I sat on the balcony enjoying a cool beverage in the waning sunlight, two squirrels caught my attention. As if for my personal enjoyment, they began to chase one another up and down the mighty trunks of the tree, spiraling round and round, up and down. They leaped from branch to branch, running in circles, heads down, plummeting toward the ground only to reach a prescribed point and turn to race back up again. Their antics amused me for several minutes and suddenly they were gone – vanished into the grey-green bark of the tree as quickly as they had appeared. 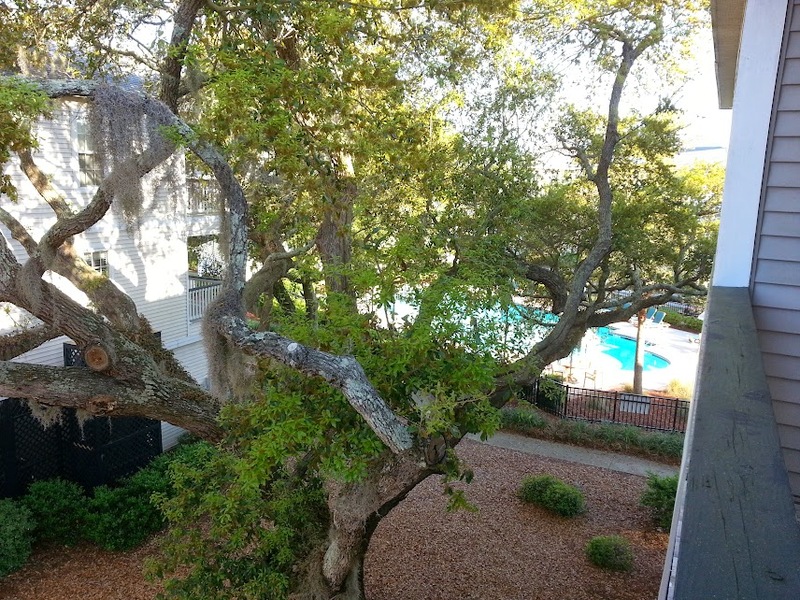 Like nearly every tree in Edisto Island, the tree outside the balcony was draped in Spanish Moss. That day, while I had been walking around the resort, relishing the beautiful weather, the variety of birds and enjoying the peaceful setting, I met and struck up a conversation with a local resident who was casting for fish in one of the many ponds. He filled me in on much information about the area – places to go and things to see. He had been coming to the area for many years and eventually decided to retire here, so he knows the place well. It turns out that the Spanish Moss is neither Spanish nor a moss but rather a bromeliad- a perennial herb that is a member of the pineapple family whose probable origin is in Central or South America. Like most bromeliads, it is an epiphyte, a plant that grows on another plant, but does not rely on it (the host) for nutrients. It is carried on the wind and attaches to any tree or shrub and begins to grow. It drapes itself all over the bark and produces the long grayish strands that hang from nearly every branch. It seems just like the moss one might buy in a craft store to place around a potted plant or an artificial basket or arrangement, but I was assured that I did NOT want to take any of the moss from the trees and take it home in the hopes of doing the same. The moss on the trees is loaded with little red chiggers which can cause an uncomfortable rash to any unsuspecting human who might handle the moss. So I didn’t touch. The moist coastal environment there on Edisto Island is perfect for the Spanish moss which provides nesting material for birds and shelter for bats and other animals. It thrives along the Gulf Coast and up the southern East Coast as far as Virghina and has even been spotted in coastal Delaware. Although it will attach itself to nearly any “host” tree or shrub, the moss particularly likes the plentiful “Live Oaks” which also flourish in South Carolina and can live to nearly 1000 years! It fascinated me that as you moved inland, one could literally watch the amount of moss diminish until there was none at all – in just 40 miles from the coast! While some might think it eerie or sinister in some way, I find it graceful and beautiful. I love the soft gray colour and the delicate drape on the boughs of the trees. The Spanish Moss epitomizes all my romantic notions of southern gentility. It conjures up images of rocking chairs on porches, cool afternoon breezes and sweet tea. Granted, had I been walking in a dark forest at midnight, the images might have been completely different. But why would I do that? PreviousCorned Beef and Cabbage – typically … American??? NextTouring Washington, D.C. – Never a Dull Moment! You were in my neck of the woods Deirdre! I live on Hilton Head Island and we have an abundance of stately oaks with their characteristic moss. As a carriage tour guide in Savannah when I was in college, we used to tell the tourists that the moss was left over seaweed from when the ocean covered the Lowcountry. LOL! Of course, I would always say that wasn’t really true and they would get a good laugh. So glad you had the chance to enjoy our beautiful Lowcountry. Come back anytime! Thanks, Carla! It a beautiful area! So many islands, so much history, so much to see and do. I will be back – hopefully soon! Haha, Ann! Learned that one long ago! How long are you down under? On my short list of places to visit! Safe travels!